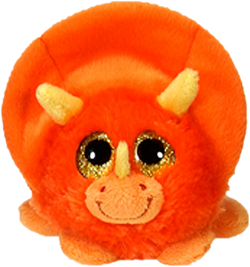 Tyke, this adorable plush triceratops dinosaur from the Fiesta Lubby Cubbies collection, is ready to spark hours of imaginative play and adventure. With soft vibrant orange fur and frill, this sweet triceratops stuffed animal has floppy lighter orange feet, yellow horns, orange embroidered nostrils and smile, and big, tear-drop shaped, sparkly golden-yellow eyes that will melt your heart. Chomp is an adorable plush t-rex dinosaur with soft royal blue fur, embroidered toothy smile, and sparkly turquoise eyes. Kiwi is an adorable plush turtle with soft green fur, an amazing shiny plum shell, and sparkly golden eyes. Stuffed triceratops dinosaur Trey has soft orange fur, lemon tummy, fun yellow horns, and big sleepy green eyes. Transform your child's room into a jurassic region with this adorable Triceratops Dinosaur fabric wall art.